Alice House Hospice Hospice sets out to ensure that every person, to the last moment of their life, is treated with dignity and respect and given the support and care they need; the patient is at the heart of all of our activities. As a requirement of the Health Act 2009, we produce an annual Quality Accounts document which measures our services by reviewing patient safety, effectiveness of treatments and care and feedback from patients and families about the care we provide. 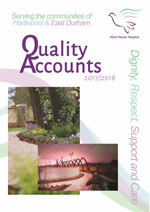 Quality Accounts are an important way for the Hospice to report on quality and show improvements in the services they deliver to local communities and stakeholders.